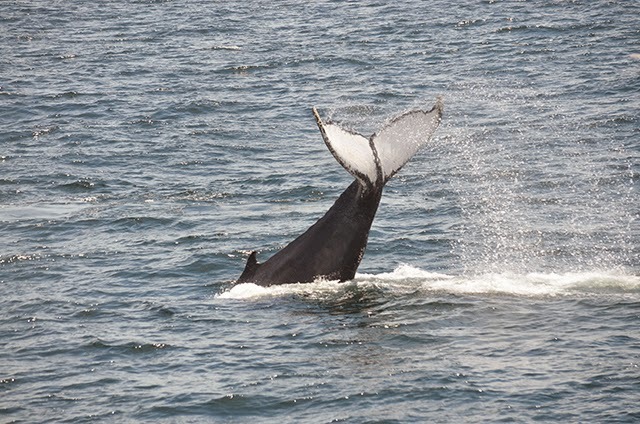 We were eager to get out today for our 9am whale watch for good reason! 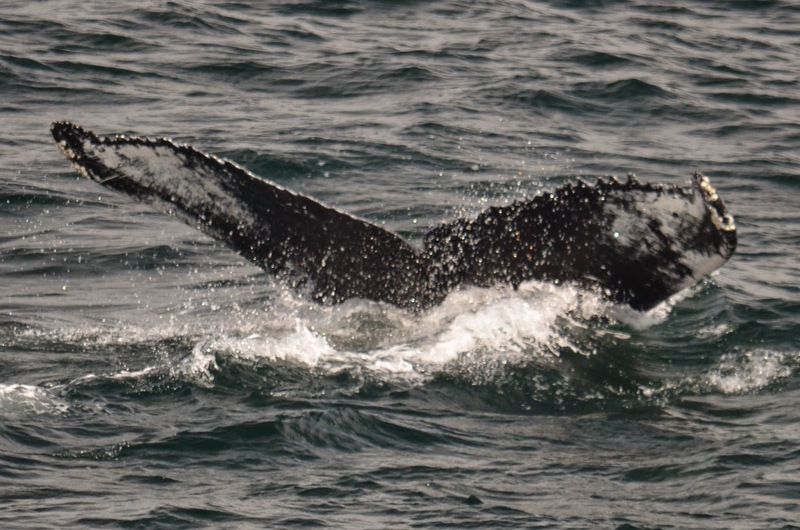 The humpbacks have been unbelievably active just west of the bank rather close to Boston. Our morning trip did not disappoint. We had 7 to 10 groups of humpbacks feeding all around us. 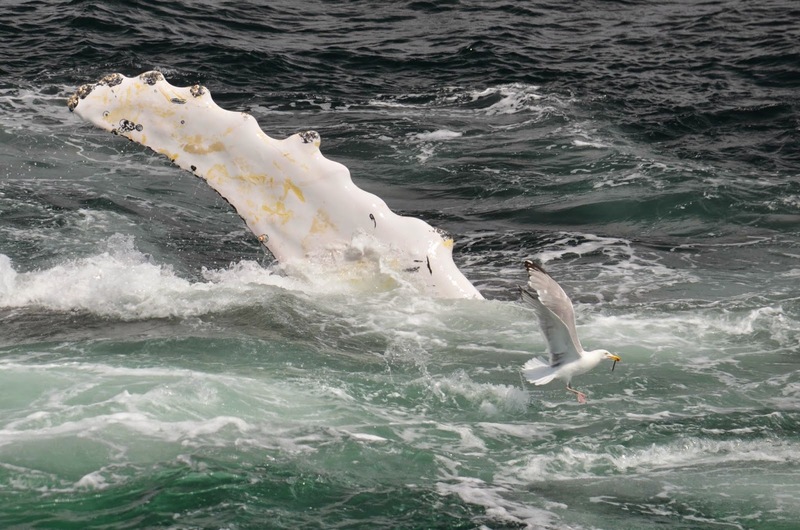 Rather than the traditional bubble net feeding, these humpbacks were kick feeding. With so many different whales around us kick feeding, you could see how all the different individuals had their own variation of the technique, some adding a chin slap or resting their fluke just on the surface before striking. We were seeing all different sorts of quirky behaviors. A humpback whale named Duo’s technique was most distinct and unusual. This female, first seen in 1985, rolled on her back after each lunge while filtering out the sand lance with her belly up and one pectoral in the air as she spun consistently beside Firefly. Watching this was very strange and quite confusing at first but incredibly fascinating! Duo spent most of her time with this female, Firefly, first seen in 1990. Keeping track of individuals’ behaviors throughout the joining and splitting of groups today was extremely difficult. Most of the groups were very small and constantly changing. Just about all the individuals seen on our morning trip were new to us! In total, we IDed 13 individuals including but not limited to (some were too tough to ID) Duo, Firefly, Tilt, Sweep, Strike, Dyad, Sockeye, Epee, Thread, Touche, Moonlight, Reflection and her calf. 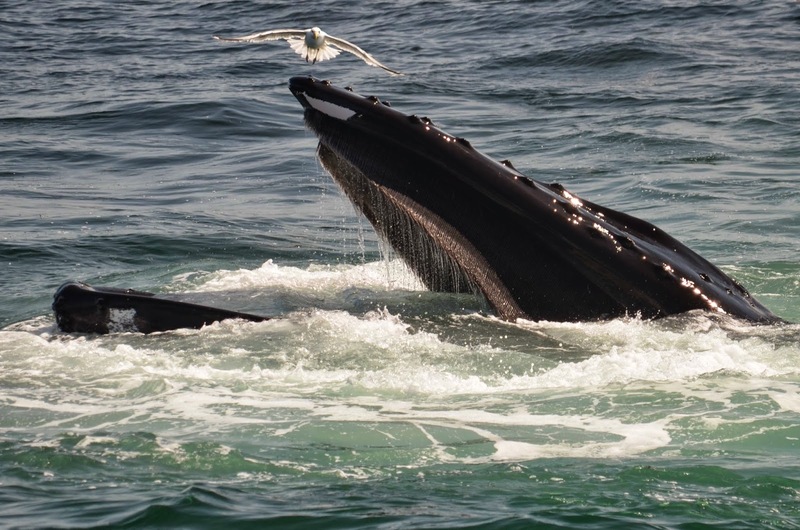 On our 1:30 trip aboard the Asteria, we went back out to where we had encountered the bulk of humpbacks earlier. 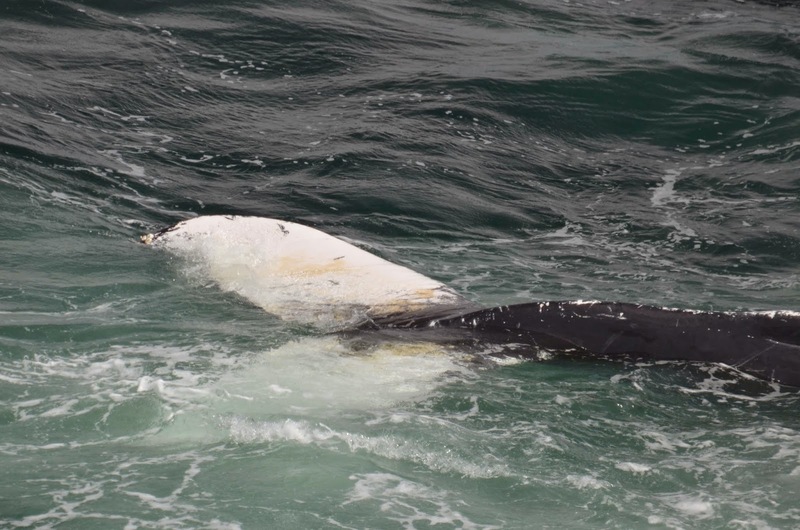 We first found two humpbacks, Rocker and Thread, who had stayed behind while the others moved east. Rocker was rocking out and doing some serious lobtailing as Thread swam beside him. 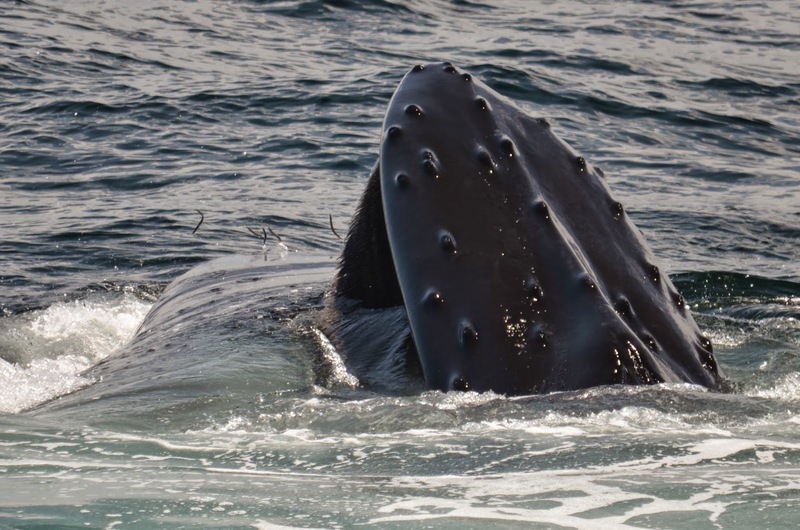 We then traveled a bit further east where there were again around 6 to 8 groups of feeding humpbacks! We had an amazing and overwhelmingly fun-filled trip as the many whales continued to exhibit a wide range of feeding behaviors. In addition to Rocker and Thread, we saw Zap, Rapier’s ’09 calf, Wyoming, Genie, Leukos, Nimbus, Jumanji, Duo, Epee, Moonlight, Dyad and Tilt among others I was unable to ID. Worth noting, Dyad, first seen in 1987, is actually Jumanji’s mother and was born 15 years ago. Calves only stay with their mothers for the first year of their life so this common sighting is coincidental. Dyad likely brought Jumanji to this area the first year of her life as Dyad’s mother did her. Sharing the same feeding grounds, they are likely to have a run in but it is unclear whether or not there is recognition between mothers and calves later on in life. Other than the coincidental run in, they didn’t appear to have any distinct association with one another which is not surprising. I had some folks asking about where exactly the whales have been so I’ve attached a screen shot of both our tracks. The second track is the one a bit further to the east. Hopefully they don’t go too far east so we can enjoy this special treat for the weeks to come! Today was another exciting day out on the water! 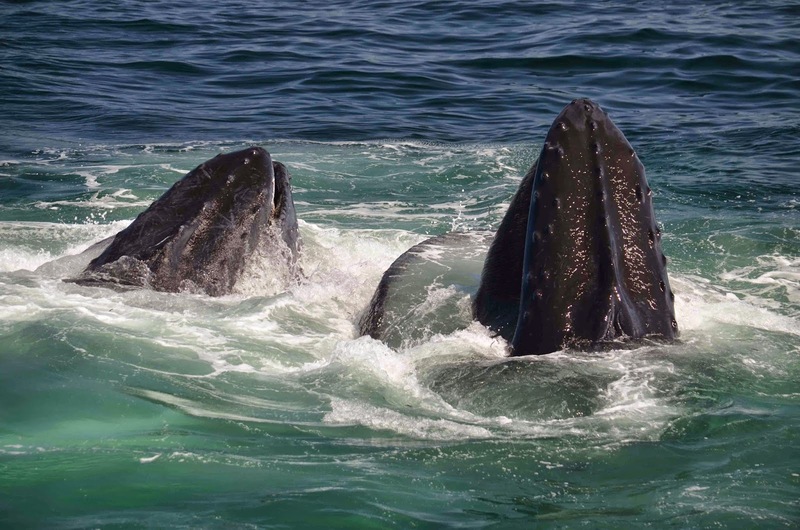 Once again the whales were feeding relatively close to Boston just off the coast of the North Shore near Gloucester! There were MANY feeding humpbacks in the area. We were able to ID Thread, Firefly, Sweep, Duo, Strike, Reflection and her 2014 calf. We saw lots of exciting kick feeding in the area and it seemed as through every whale had a different style. There wasn’t a bad seat in the house today because there were literally whales in every direction. The most exciting part of the trip was when Reflection and her 2014 calf approached the boat. Passengers were surprised and extra excited to see them up close and personal. Reflection even did some very splashy kick-feeding right next to the boat. 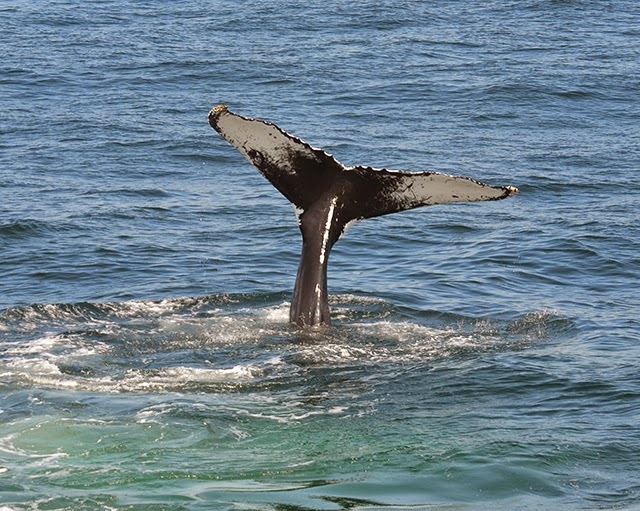 It’s always exciting to have a splash-zone on a whale watch! I hope these whales stick around for a while because they are amazing to spend time with! 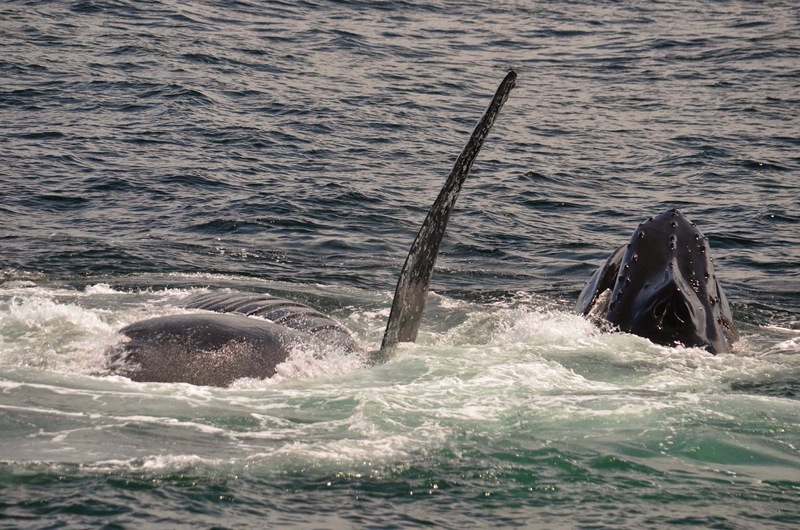 Today we headed north of the northwest corner of Stellwagen Bank to once again find a feeding bonanza of whales. Many whales were blowing bubble clouds and kick feeding and displaying great open mouth feeding behavior. We got to see many whales that haven’t been sighted this season yet, even a new mom and calf pair that hasn’t been sighted before. The entire groups of animals moved around the boat feeding which was just fantastic. All together we identified Strike, Tunguska, Wyoming, Epee, Moonlight, Iris, Erosion, and mother and calf pair, Midnight and her calf. 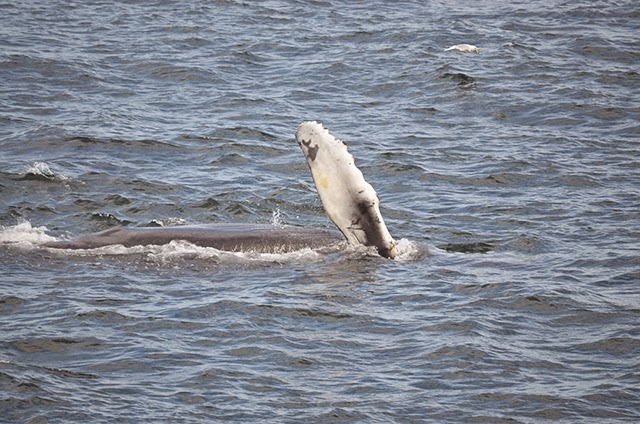 This calf was particularly adorable as it did some pectoral fin slapping. Like all babies, humpback whale calves just seem roly-poly and cute. 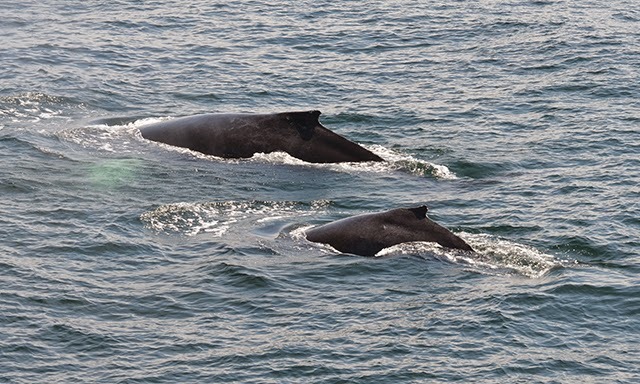 Some of these whales like Iris and Strike are new whales to me completely who I have never seen before, and others like Midnight and Tunguska are ones I have seen in past seasons and it is great to see them feeding in our area again. 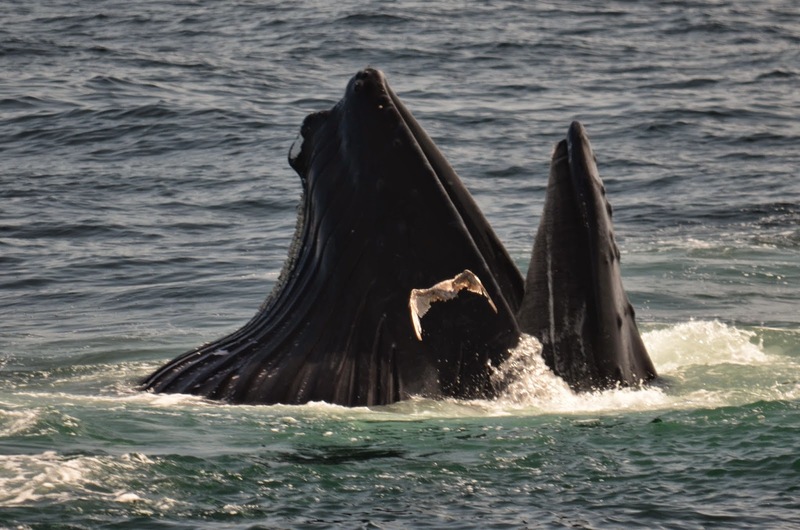 Most of the whales were fixated on feeding today and the activity never waivered with great kick feeding displays from Wyoming and Moonlight. 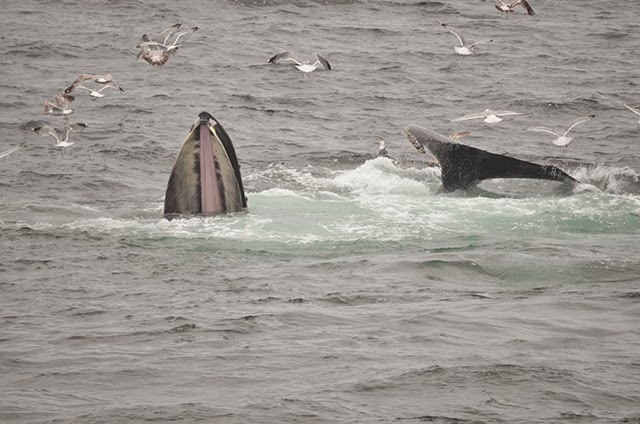 Open-mouth feeding—look at all that baleen! 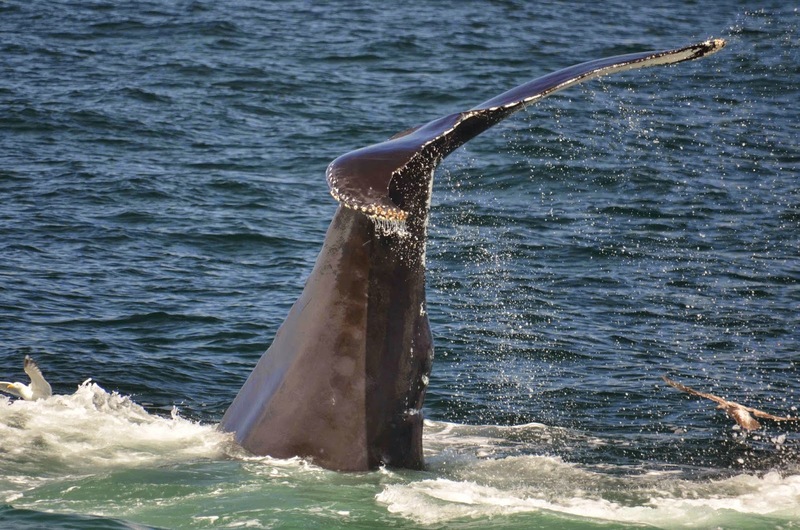 Passengers, especially first time whale watchers, got a fantastic trip today.